How To Reset Your Password Without A System Disk. Have you lost your Mac password? Are you unable to get into your computer because of it? Apple lets you restore your password if you have the system disks that came with the computer, or–if you have a newer non-optical disk machine like a Macbook–with the built-in system recovery mode. If you aren’t able to access your system disks or the recovery mode, there’s a couple of tricky ways to reset your password. Both methods are explained in a video by Quinn Nelson on his YouTube channel, and they’re pretty great ways to reset a lost password. A word of warning, though: this is also a way a malicious person can gain access to your Mac. If you have sensitive documents on your Mac, you owe it to yourself to use FileVault or a third-party encryption tool to add another layer of protection that doesn’t require your admin password. First up, you’ll need to start your Mac up in single user mode. You do this by restarting your Mac, and right when you hear the start up chime, hold down the Command and S keys simultaneously. Hold them down until you see the little gear icon on your screen; you can let them go at that time. You’ll see a black screen with white writing on it. This is like the Terminal app; you’ll need to enter in commands to make this all work. To reset your password, try the following method first. If it doesn’t work (and it should for approximately 98 percent of Macs out there, you can try the next method. Make sense? Once you reboot your Mac, you’ll need to enter in the new password, and then reset your keychain (unless you know your old password, which begs the question of why you’re doing this in the first place). What this method does is trick your Mac into thinking that it’s a brand new Mac. You’ll have to go through the entire process of setting up your computer with a second administrator account. Once you do so, however, you can log in with this new account, and then hop into System Preferences and Reset the password for your original account. It’s kind of tedious, but may be the best way for you to get back to your stuff. 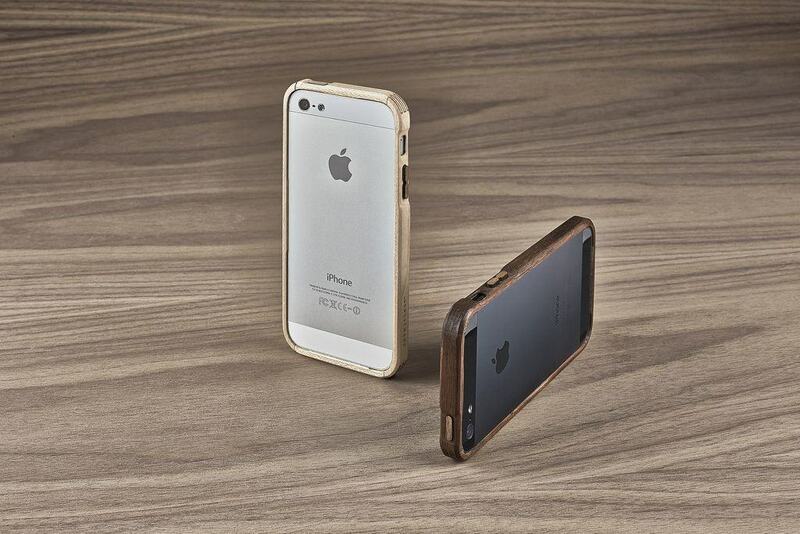 Grovemade’s First Wooden iPhone Bumper. A bumper is a great option for folks who don’t care for cases, but are clumsy enough that they need some protection for their iPhone. And the brand-new Grovemade wooden bumpers not only offer protection but look great too. Also, they have names that you’ll want to lollop around your tongue, over and over. Try those names now. Maple Bumper. Walnut Bumper. It’s not quite as orally satisfying as rolling the word “handleband” around your mouth, but it’s close. 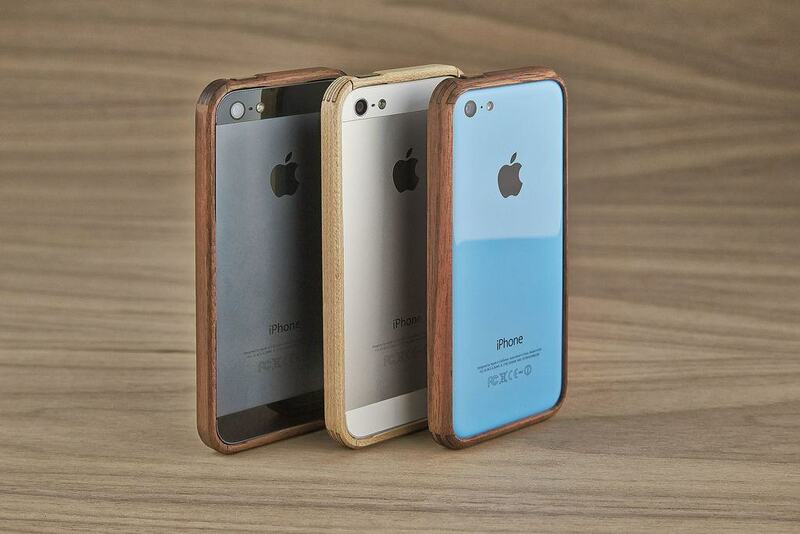 The cases, as you may have guessed, come in walnut and maple, and are fitted for the iPhone 5/S or the iPhone 5C. They’re light, naturally shock-absorbing and are slightly thicker than the iPhone so you can lay them down without the screen touching the table or scratchy concrete floor. They have wood volume and power buttons, and come in one piece. We’ve reviewed Grove’s cases before on Cult of Mac, and I found them bulky and expensive. But at just $39, and in the form or a bumper, these new cases seem to have those problems licked. Available from today. Latest iPhone 6 concept based on Japanese sketches looks more persuasive. Martin Hajek has been busy this week: after iPhoneclub commissioned him to create concept images of an iPod Nano-inspired design of the iPhone 6, French site Nowhereelse asked him to use the Japanese sketches mentioned in that piece to create something far closer to the existing iPhone 5s design. The design also returns us to the single rocker-style volume button we saw on early iPhones, rather than the two separate buttons seen on later ones. Hajek has an interesting take on the gold iPhone, giving it a white casing with gold edging. We’ll be reading the comments with interest on that one. As with the earlier concept, the thinness is probably not entirely realistic, but we can probably expect to see Apple shave a little off the depth of the phone as the larger form factor permits a thinner battery. As we mentioned earlier, we’re far from convinced that the original sketches are real, but it’s certainly interesting to see renders of something that is probably somewhat closer to the real thing. As ever, let us know in the comments what you think. The Griffin Twenty: An AirPort Express Amp That Brings Your Wired Speakers Back To Life. The Griffin Twenty is a system that takes your existing speakers and allows you to do something new with them. You don’t need an iPhone speaker dock, or Bluetooth speakers, or cables. Connect your favorite speakers to Twenty, and it acts as your stereo receiver for pure digital sound. Twenty is a problem solver. It doesn’t let your nice, expensive speakers sit around gathering dust. It allows you to beam music wirelessly – through AirPlay – to speakers that have never before had that capability. In short, it’s a game-changer. Connecting your AirPort Express to Twenty with the TOSLINK optical audio cable allows you to blast music from any Airplay compatible device, iTunes library or app like Pandora, Rdio, Spotify and more – all while using those sweet speaker towers you still have from your college days. Microsoft hopes iPad users won’t exploit Office loophole. Microsoft wants you to buy Office 365, making the $100 subscription service mandatory to access the full power of Office apps for iPad. But if you don’t want to pay the price, you don’t technically have to. After tinkering with numerous devices and accounts since the debut of Office on iPad Thursday, CNET discovered a loophole in how Office 365 authentication gets enforced on Apple tablets. The loophole allows users who have not paid for the subscription to enjoy the benefits of those tablet apps for iOS. “Similar to our commercial use rights, we do not strictly enforce the limit on tablet installations, but trust that our users respect and understand the device limits outlined in the EULA [end user rights agreement],” a Microsoft spokesperson told CNET. Subscriptions now form the backbone of Microsoft’s software licensing, and the company has made an aggressive push to make it as convenient as possible to access its Office app suite through an Office 365 subscription. It wants to turn one-time customers into annual ones, and users are signing up. Within hours of going live on Thursday, the apps grabbed the top four slots in the free category of Apple’s top charts. Sweetening the deal, Microsoft gives you — for less than the price to buy the software outright for only one computer — the ability to install Office on five Macs or PCs and up to five tablets. However, there’s nothing to stop you from trying a sixth tablet, or a seventh or an eighth — or beyond. For now, there is no set limitation. Similar to sharing around an HBO Go password among friends, all that’s required to exploit the loophole — which, again, is against the rights agreement that limits you to authenticating only five tablets — is to have someone with a valid Office 365 account log in to Word, Excel or any other Office app on iPad. Once that happens, the tablet is automatically authenticated for all Office apps and any future users, regardless of whether or not those users have paid for 365. In other words, someone with a Microsoft account that was, just minutes prior, unable to access the best features of an iPad Office app will then be able to utilize the full version — as well as other downloaded Office apps — seemingly indefinitely. The prompt to pay for 365 or resort to using the “read-only” mode disappears. Not only will you then be treated like a paying 365 customer — meaning you’ll be automatically signed in to full versions of all the other Office apps once you sign into your first — but all files will sync to the Office Mobile iPhone app and vice versa. It wouldn’t be exactly practical to find reason to install Office on more than five iPads, and the fact that any 365 user gets 10 total installs makes the service highly economical from a customer standpoint. But in the worst-case scenario, someone can share their Microsoft Account details with a large number of friends, or perhaps post them somewhere online, and authentication for Office iPad apps can be distributed limitlessly. Microsoft confirmed that it does indeed track how many versions of Office for iPad a single account has authenticated. What action Microsoft would take if, say, a 100 people were piggybacking on a single 365 subscription is unclear, but the five-tablet limit is explicitly laid out in the user agreement very high up. It’s also currently unclear what would happen if the original person whose Office 365 account was used to authenticate a tablet did not renew the subscription, though it would appear as if that would disable all others because the account is still monitoring how many activations there are. It’s also unclear what may happen in future updates to the apps, or in the case of deleting Office apps or resetting one’s device. That Microsoft is putting its trust in paying customers is either due to what may be a technical oversight or the fact that it’s not worth the trouble, yet. Depending on how this workaround is utilized, Microsoft may need to examine methods to forcible keep users from disseminating Office authorization to iPads far and wide. 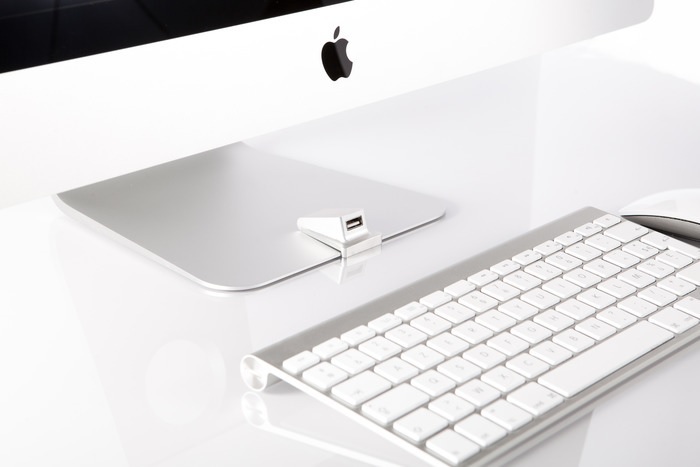 iMacompanion Adds A USB Port In Front of Your iMac. There’s no denying that iMac is a great machine, and comes with a solid hardware. All the ports, the USB slots, simply everything is not in the most desirable position. Certain USB devices, such as a printer or a hard drive, may always stay connected to your iMac. They can therefore be plugged into the rear ports of the iMac and left there without a problem. However, when you want to add files from your USB thumb, or transfer photos, or other day to day uses for a USB port – accessing them in the back can be a hassle! The iMacompanion solves that problem by giving you access to a front USB port while preserving the design of the iMac. iMacompanion is made of sandblasted and anodized aluminum to seamlessly integrate itself at the foot of the iMac. 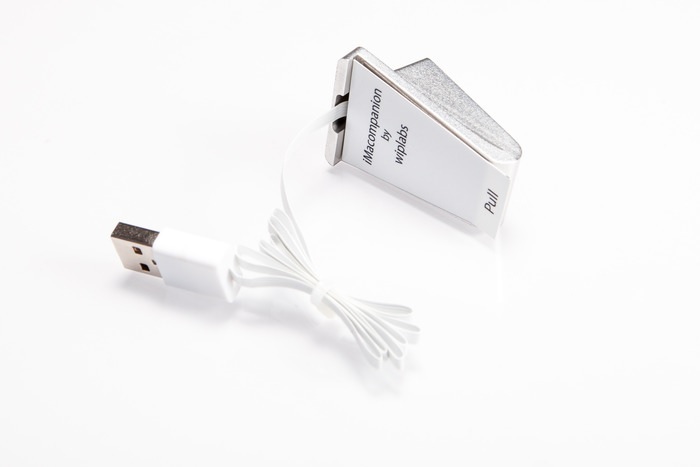 You can plug it into a USB port on your iMac, and the front end of it can be attached to the base of the iMac, providing users with quick access to a USB port. The wires are too thin, and are hidden under the base. The project is seeking funds on the crowdfunding website Kickstarter before they can enter mass production. The project is looking for $9,999 and have already raised almost $11,000 with 29 more days to go before the project ends. Once completed, the accessory is expected to hit retail with a price tag of $39, which sounds pretty reasonable considering the convenience it brings for iMac users. If you think this is something useful, head over to Kickstarted and pledge for the project. Early birds are expected to get their units by July 2014. 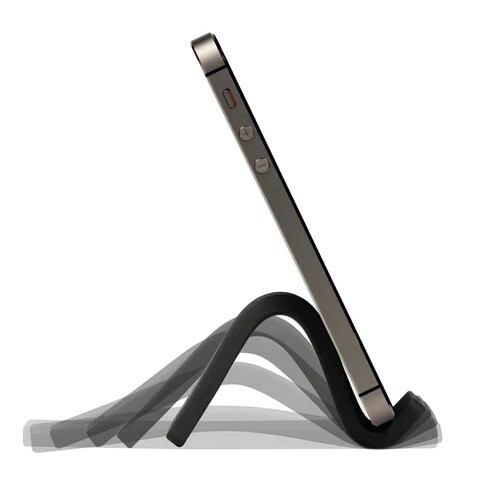 Stunningly Simple iPhone Stand Offers Flexible Form And Function. 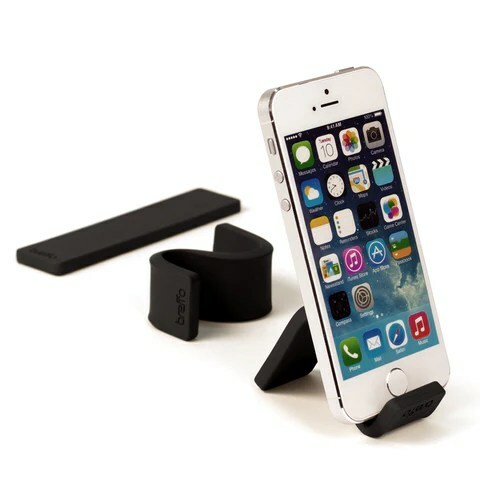 Need a way to hold your iPhone up in portrait or landscape mode? Hate wrapping it in some bulky case that hides the natural tech-beauty of Apple’s best smartphone design? The Breffo GumStick aims to solve your problems, friends, with a minimalist iPhone stand that looks–and works–like a stick of gum. The GumStick is a flexible bit of rubber that holds its shape, letting you bend and twist it into the perfect complement for your iPhone and whatever environment you want to use it in. You can flatten it out for easy portability, too, letting you take it with you to the coffee shop, onto the plane, or anywhere else you might want to prop up your iPhone. Best of all, it will work with any case you decide to put your iPhone in–or no case at all. I’ve used the Breffo SpiderPodium for years, and its held up incredibly well. If the GumStick is as well-designed, it should be a fantastic product. The GumStick comes in Black or Graphite colors, and though the latter is currently sold out, you can purchase one on the Breffo site for an affordable $19.99. Me? Oh, I’m just casually watching Netflix here on my iPhone.